News: Is this Oil Bible a Supernatural Miracle or a Hoax of Biblical Proportions? It’s now a two-year-old-mystery: how have 200 gallons of oil poured out of an ordinary Bible in Georgia? People have been speculating, examining, and writing about this seemingly miraculous Bible since it first began its mysterious oil flow in January 2017, and so far the questions - and the oil - still keep coming. “For the last 18 months, gallons of oil have been flowing out of a Bible in Georgia, and some are calling this “an end times miracle”. You may be tempted to think that this is some sort of a stunt to make money, but that isn’t happening. In fact, the owner of the Bible actually gives away vials of the oil for free, and people are allowed to freely dip their hands into it. The oil has been submitted to a chemist for testing, and he confirmed that it is oil, but it doesn’t appear to be any sort of oil that is produced by man. So could it be possible that this is a real miracle, or is this just some sort of cruel hoax? In the back of a little gift shop in Dalton, Georgia there is a prayer room. For the past two years people have gathered there to pray for their city, region, and each other and intermittently oil has dripped from the walls. 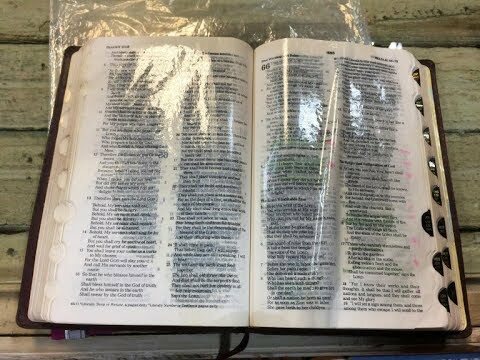 January 27th of this year one of those prayer warriors, Jerry, noticed his Bible was dripping with oil. Starting with Psalm 39 it spread over the next few days through the rest of the Old Testament, the New Testament, and the concordance. Then the oil started back in Genesis and spread till it covered the whole Bible. When he realized the oil wasn’t going to stop, Jerry put the Bible in a ziploc bag at first, but as the oil continued, he had to size up to larger and larger containers. The bucket he now keeps it in continues to refill. God told him early on that as long as he gives the oil away freely and does not sell it, the oil will continue to flow. So is there anything particularly special about this oil? Well, it is claimed that people have been healed from a number of different diseases after being anointed with this oil, and that includes cancer. In addition, the oil has no taste and no color, and when it was sent in for testing, the chemist said that it was “most similar to mineral oil”. Over time you would think that the oil would damage the Bible, but as you can see in the video above, not even the highlighting that had been previously done has been affected by the oil. Of course not everyone is convinced. On one Christian website, this miracle was dismissed as a “bizarre and comical claim”. But no evidence was presented that disproved this miracle. In fact, no source that I have been able to find has been able to disprove this miracle so far. What do you think about this outpouring of oil? Is it a supernatural miracle or a hoax of biblical proportions? Tell us in the comments!